The manufacture of carefully-prepared impromptus was at one time—the time of ruffles, snuff-boxes, and periwigs—almost a fine art; but, as with stage-coaches and pattens, it is thought less of now than in the Georgian era. A beau of the period would take as much pains over an epigram as a theatrical manager does in the production of a comedy; and he would even go through the process of what is called "trying it on the dog," by rehearsing the witticism to his valet; and at last, when the proper moment arrived, he would let off his witty pyrotechnics, which would be flashed over half the London coffee-houses. 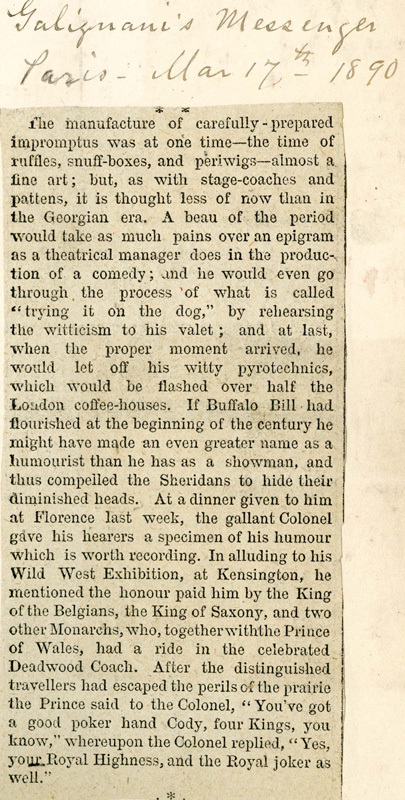 If Buffalo Bill had flourished at the beginning of the century he might have made an even greater name as a humourist than he has as a showman, and thus compelled the Sheridans to hide their diminished heads. At a dinner given to him at Florence last week, the gallant Colonel gave his hearers a specimen of his humour which is worth recording. In alluding to his Wild West Exhibition, at Kensington, he mentioned the honour paid him by the King of the Belgians, the King of Saxony, and two other Monarchs, who, together with the Prince of Wales, had a ride in the celebrated Deadwood Coach. After the distinguished travellers had escaped the perils of the prairie the Prince said to the Colonel, "You've got a good poker hand Cody, four Kings, you know," whereupon the Colonel replied, "Yes, your Royal Highness, and the Royal joker as well."